A retired political consultant who is gay says he’d consider it a “victory” to be included in the debates for 2012 Republican presidential candidates. Fred Karger has just spent about $1000 to run a 90-second commercial about himself on the FOX News Channel in seven different Iowa media markets for the next week. “As I look at the Republican Party membership here (in Iowa) and I’ve seen polls, you know, 80 percent self-identify evangelical and I don’t know how open they are initially to an openly gay candidate if I do decide to run,” Karger says. 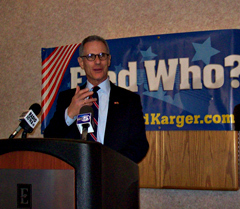 Karger held a news conference in Des Moines this morning, telling reporters his goal is to emulate candidates like Shirley Chisholm, the first African American to run for president, and be the first openly gay candidate for president. Karger, who said he was so “disenchanted” with the Republican candidates of 2008 that he supported Hillary Clinton’s 2008 bid for the White House, calls himself an “independent Republican” in the ad. Karger has hired a state director for his exploratory committee, a step nearly all presidential candidates take before making an official plunge into the race. Karger, who is 60, described himself as the “worst nightmare” for his adversaries because he’s retired and has all sorts of time to campaign. He’s also researching legal strategies to try to get a spot on stage when televised debates are held. “If I can get in some of those early debates, I will declare victory,” Karger said. But Karger also admitted his candidacy is “a little presumptuous” because he’s never held office before.